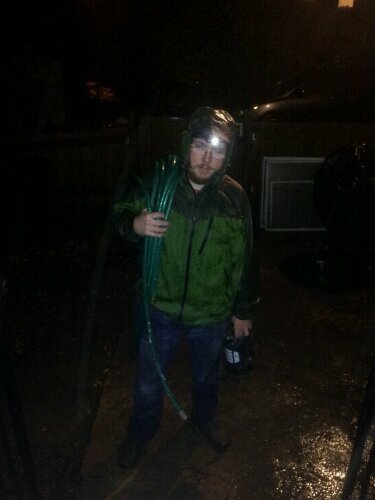 Sometimes When You’re a Homeowner . . .
. . . You have to go out in the rain and get stuff done, by yourself. So yesterday I climbed up on the roof with my leaf blower and cleaned all of the muck out of the gutters all the way around. Then, I got up all of the rest of the leaves in the yard from the fall. I felt super accomplished. Well, today we’re on a flood watch in Atlanta because of the 1-3 inches of rain we’re supposed to get. It sure is a good thing I cleaned out those gutters! The gutters were so clean and free-flowing that the water overflowed the clogged pipes I installed to channel the runoff away from my foundation. Wait, I didn’t install clogged pipes. They got that way when I blew leaves out of the gutters into them. Since the ground pipes were clogged, they overflowed and flooded the foundation, filling my basement like I’ve never seen. I wouldn’t have seen it at all if my lovely wife hadn’t asked me to fetch something from down there. Thanks lovely wife for saving the day! So. . . Now that I had water in the basement and clogged pipes and it’s Sunday night and the Grammy awards are on and I was gonna cook dinner and all those other plans, I put on my raincoat, forgot to change out of my nice jeans and shoes, and trudged outside to unclog and drain and play in the puddles. My neighbor let me borrow his sump pump so the basement was dry empty of water minutes after I stopped new water from entering. The moral of this story: when you own a home, sometimes you have to change your plans and fix some stuff, by yourself. You can do it. Just go out there and get that stuff done. The other moral of this story: don’t clean your gutters. It’ll apparently clog up everthing else. 1 Response to Sometimes When You’re a Homeowner . . .
Been there, done that. I ran around the outside of our new house in the pouring rain for 30 minutes to figure out what gutters leaked and where water pooled against the foundation. Great stuff here Robby. You are right; the To-Do list on an old house never ends (just bought a house built in ’78).